More than just an image of a similar breed, Leah creates a thoughtful, engaging work of art that is a true likeness to your beloved companion." 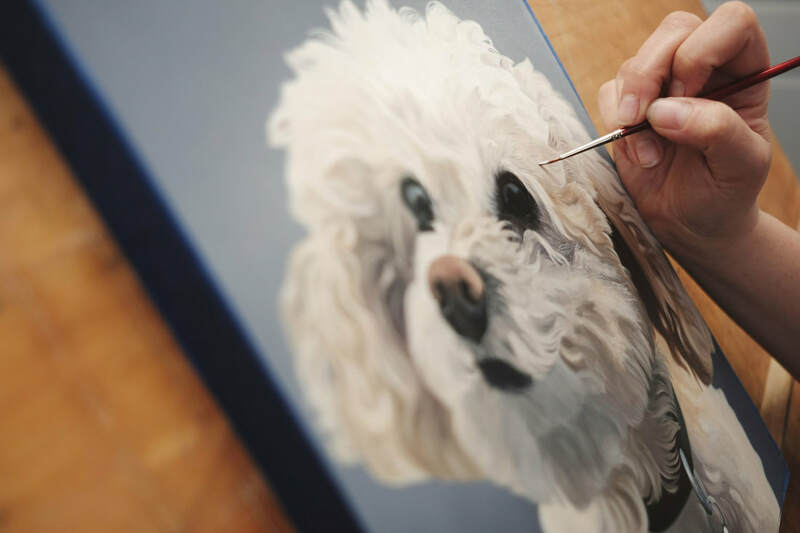 Using traditional oil painting methods, 90% American-made materials, and a keen eye for details, Leah creates unique and timeless works of art celebrating your best friend. Each portrait is painted on wood artist panels, with the background color wrapped around the edges. A simple mechanical pencil, and loose powdered graphite applied with a brush on drafting film are what make Leah's drawings incredibly tactile and life-like. These are more than sketches, but highly refined works of art. Single subject, solid color background (paintings) or clean white background (drawings). Email or phone consultation to get every little detail just right: review of your photos; composition and color choices; home decor & style; additional customizations. Collaboration with the artist creates an unmatched experience, inviting you into the process and development of your portrait. Photographic and/or video updates chronicle the journey. Delivered via USP or USPS; painting arrives ready to hang. Custom sizes beyond those listed above. Your imagination is the only limit.